Lambert Pharmacal Co., 2½¢ red, provisional, thins and minor staining, otherwise F.-V.F., a rare provisional proprietary issue. Walker & Taylor, Revenue, 1862, First Issue, 2¢ Proprietary, perf'd, bold printed straight line "Walker & Taylor, Proprietors, W.B. Sloan's, Condition Powders, Horse Ointment, Family Ointment, Instant Relief, P.&B. 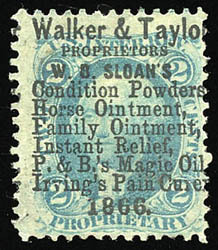 's Magic Oil, Irving's Pain Cure, 1866" cancel, small thin, F.-V.F. 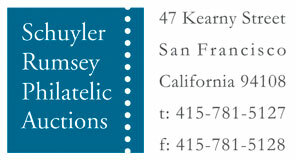 appearance, a attractive example of the scarce Walker & Taylor printed proprietary cancellation. Scott No. R13c Estimate $150 - 200.